Preliminary ProceduresRemove the front bumper fascia support. Refer toFront Bumper Fascia Support Replacement.Reposition radiator forward. 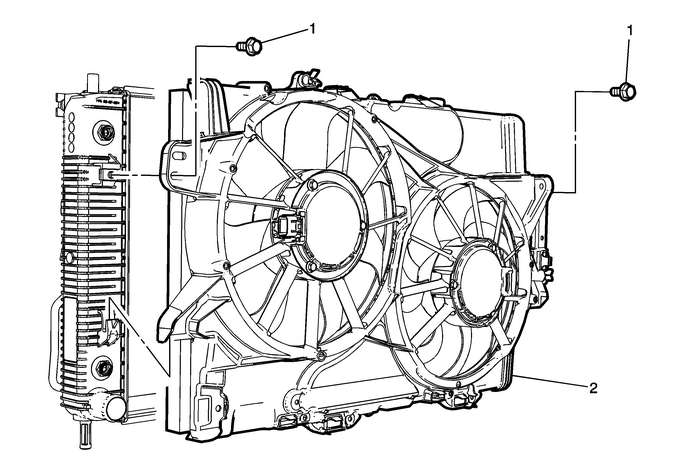 Refer toRadiator Replacement.Unclip the transmission cooler lines from the engine coolant fan shroud.Unclip air conditioning lines from the engine coolant fan shroud.Disconnect the engine coolant fan motor electrical connector.Disconnect engine coolant fan resistor electrical connector. ProcedureDisconnect cooling fan motor wiring harness.Disconnect cooling fan resistor wiring harness.